Bergamo Airport is 50 kilometres northeast of Milan and 90 km east of the lower eastern leg of Lake Como close to the town of Lecco which is 30 km to the north. Bergamo has a strong cultural heritage which is evident throughout the city and is definitely present in the hotel accommodation on offer. Bergamo is located at the foothills of the Alps, offering spectacular views and exploring opportunities if you decide to hire a car. Whether you decide to stay in quaint moderately priced accommodation or pamper yourself by staying in a luxurious hotel with its own spa you will be enchanted by its charming traditions and friendly locals. 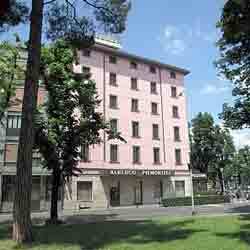 It is divided into two parts and you can either stay at Bergamo Basso (Lower Bergamo) or Bergamo Alta (Upper Bergamo). Bergamo Alta is on top of a hill with stunning views and can be reached either by car or funicular. Bergamo Basso is closer to the central train station and more convenient to get to, but much less charming than Bergamo Alta. There are a large number of Bergamo hotels in to choose from ranging from five star luxury to bed and breakfast accommodation. If you are travelling on a budget and looking for a cheap hotel or want to travel in style staying in a top of the range hotel with exceptional service, you can find accommodation to suit your taste here. 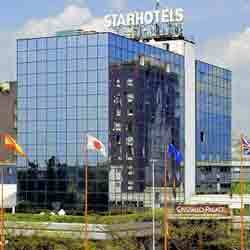 Below is a small selection of 3 and 4 star hotels which are close to Milan Bergamo Airport. Just a few minutes from the airport, railway station and city centre, the Cristallo Palace offers free outside parking, private garage and car rental. There is a complimentary shuttle service to the town centre and the railway station (available from Monday to Friday), and 7 first class executive meeting rooms equipped with the most modern technology which can accommodate up to 450 people. 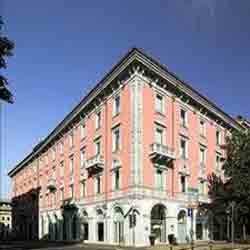 The Mercure Bergamo is an elegant building in the centre of Bergamo, Palazzo Dolci, opposite to Papa Giovanni Congress Centre and near Donizetti Theatre. The Hotel Cappello d’Oro is centrally located close to the funicular railway leading to Città Alta and is easily accessible from the Bergamo Airport and the railway station. The hotel has was completely refurbished in 1997 and offers 91 well equipped guest rooms with cable television, telephone with dataports, coffee/tea maker, hairdryer, iron, ironing board, mini-bar and 24-hour room service. There is a fitness centre with sauna and a small conference room at the hotel which can accommodate up to 30 people. The "Ristorante del Moro" offers tasty regional cuisine and Sunday brunch. The Hotel Piemontese is close to the train and bus stations in thwe city centre, just 3km from Bergamo Airport located near the motorway exit between the railway station and the beginning of Papa Giovanni XXII Street – the headway of lower Bergamo. The hotel has 55 guest rooms which come well equipped with every modern amenity to ensure that your stay there is comfortable and enjoyable. 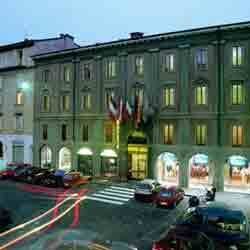 Hotel Arli is in the centre of lower Bergamo, less than 4km from the airport. They offer an excellent restaurant, business centre and a luxury wellness centre. The Arli Hotel was completely refurbished at the beginning of 2009 and offers free Wi-Fi, a gym and new wellness centre which has a sauna, Turkish bath and hydromassage. The comfortable rooms include a modern bathroom with free Wi-Fi in communal areas plus a free internet point. The hotel also features a well equipped conference room with a maximum capacity of 20.Your room is comfortable and includes a modern bathroom. You have free Wi-Fi in communal areas plus a free internet point. 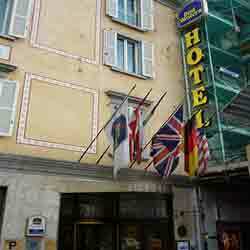 The hotel also features a well equipped conference room with a maximum capacity of 20. Enjoy a delicious mix of Italian, international, and vegetarian cuisine at the restaurant, open for both lunch and dinner. Wine tasting is available in the new, sophisticated wine bar. Plus, the café is open all day and provides drinks and snacks.The Hotel Arli has 66 guest rooms and offers excellent amenities including a conference room which can accommodate up to 20 people, a restaurant serving international cuisine, wine bar, café and currency exchange.